Six Sigma and Six Sigma certification, which is offered at various levels, can be confusing. Jennifer helped to define and guide those interested in this discipline. Six Sigma is a disciplined, data-driven approach or methodology to project management that eliminates defects in any process. It drives towards six standard deviations between the mean and the nearest specification limitation. Six Sigma mostly measures quality of manufacturing output, but also quality of products and services. Companies that have applied Six Sigma and found success with the approach include big enterprises such as, Amazon, 3M, Boeing, Ford, GE, McKesson, Johnson Controls, GEICO and the US Army and Marines. While Six Sigma isn’t the standard across all aspects of these companies, it can be applied where needed and show positive results. What Are the Five Basic Stages of Six Sigma? What Are the Requirements to Take the Six Sigma Exam? If you want to get certified in Six Sigma, first you must have been involved in analyzing and solving quality issues. This means you have worked with Six Sigma, Lean project management, or any other quality-related projects. These requirements also differ depending on the level of certification you’re seeking. Certification is offered by the International Association of Six Sigma, and there are three levels of certification. Black Belt: The most advanced certification costs $395 and can be achieved two ways, either with three years’ experience in one or more of the areas mentioned above, plus one complete project with signed affidavit; or two complete projects with affidavits. Depending on the organization you work with that sponsors your certification, the process can take from one to three months to study and complete. Companies invest in Six Sigma certification because it offers a designed set of tools and techniques that help improve the processes within an organization. The primary goal of certification is to validate individuals who posses skills needed to identify errors in a process and eliminate them. If big, successful companies can profit from Six Sigma, so can you. Pro-Tip: Take a moment to learn more about the Define, Measure, Analyze, Improve, Control (DMAIC) roadmap and Lean Six Sigma by reading this guide for project managers. 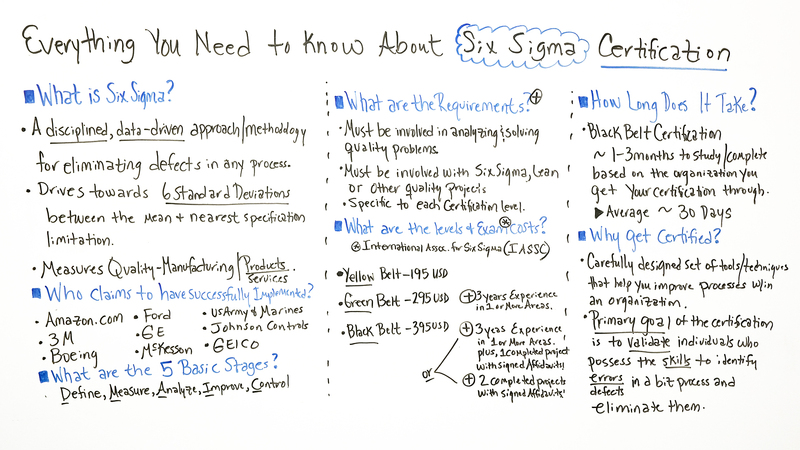 Today, we’re talking about everything you need to know about Six Sigma Certification. Well, most people want to know what is Six Sigma. They want to know a clarification on the levels they’ve heard about. And they want to know more specifics about the certification exam. So that’s what we’re going to talk about today, including why it’s beneficial to get certified. Well, first of all, let’s talk about Six Sigma and clarify what it is. So it’s a discipline, it’s very data-driven, it’s an approach and methodology for eliminating defects in any process. It drives towards six standard deviations between the mean and nearest specification limitation. So it’s very statistically oriented. So it measures the quality, you see it most popularly in manufacturing. You also see it with products and services. So people want to know, well, who are some of the companies that implement it. So here are a few companies who claim to have implemented it successfully. So you have amazon.com, 3M, Boeing, Ford, GE, McKesson, and the U.S. Army and Marines, Johnson Controls, and GEICO. Does this mean success? Well, not always, because Sears used to be a company that was on the list as well and it really determines, right, on the market because Sears is not really, at this moment in time, doing that well. So it really depends, and although these companies claim to have implemented it successfully, it doesn’t mean across the whole company necessarily. It’s usually regarding one business unit, one manufacturing unit, maybe one product or service, and depending upon the conditions, if conditions in a company, something changes in the company, that can also change the certification, okay? So what are the five basic stages? So there’s define, measure, analyze, improve, and control. So those are the five stages. So what are the requirements to qualify to take the exam? Well, first of all, you must be involved in analyzing and solving quality problems. You must also be involved with Six Sigma, you may have heard of Lean, or other quality projects. And depending upon the level, it’s also specific to each certification level. So let’s take a look at some of the levels, some of the requirements, and the exam cost. So there’s one association that administers the exam, there’s one International Association for Six Sigma. So according to their chart in pricing at this moment in time…always have people go to the organization’s website and always check on the latest requirements at that moment in time, because they do change. So at this moment in time, the Yellow Belt is…cost US$195, the Green Belt is US$295, and the Black Belt is US$395. So the Yellow Belt is one of the more entry-level, and the Green and the Black, advanced. So let’s take a look at some of the requirements. So in addition to these, for a Green Belt, you also must have 3 years’ experience in one or more areas, where the more…the areas that we talked about. And then with the Black Belt, you kind of have two paths you can go by. Again, you have the 3 years’ experience in one or more areas and then also, in addition, one completed project with signed affidavits that you were part of that project. Or the other path is you complete two projects with signed affidavits. So with the Black Belt, it’s harder to get because you actually have to have experience in the projects with the affidavits. So how long does it take? So if we’re talking about the Black Belt, so if you advance from the Yellow to the Green, to the Black, then how long does this take? So because specifically people are ultimately looking to advance in those levels, because that’s where the companies looking to invest in and advance their people, and so for the Black Belt Certification, it takes about 1 to 3 months of study and to complete the exam, and it’s based on the organization that you get your certification through. Because again, your organization has to sponsor you because you have to be involved in those projects. So on average, it can take about 30 days to study and complete the exam. So some people ask, “Well, why would I want to get certified?” Well, here’s why companies invest in their people to get them certified. Well, it’s a carefully designed set of tools and techniques that help you improve processes within an organization. And the primary goal of the certification is to validate the individuals who are doing this, who possess the skills to identify the errors and defects in the business process and eliminate them. So as you can see, for the companies we talked about, how important it is for Six Sigma because there is a very high cost to the errors and the defects, either in what they’re manufacturing, the product they’re producing, or the service they’re providing. 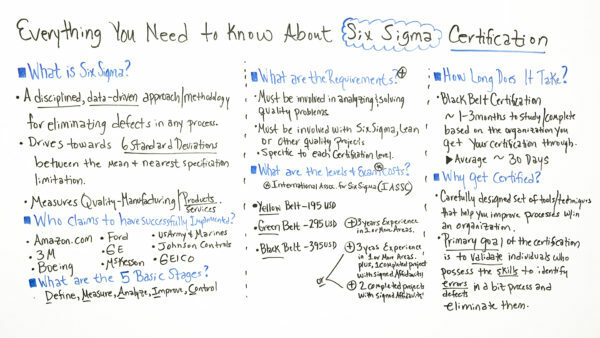 So this is everything that you need to know about Six Sigma. And if you need a tool that can help you manage this process and this project, then sign up for our software now at ProjectManager.com.